From August 27 to 30, PROAH accompanied OFRANEH (Fraternal Black Organization of Honduras) during its campaign in Vallecito (in the Department of Colón) in which OFRANEH demanded formal recognition of the boundaries of their land, which had been taken over upon by large landowners. Between Limón and Punta Piedra to the west of Trujillo there is an acute land conflict between the Garifuna community, organized in 6 Garifuna cooperatives, and businessman Miguel Facussé on the one hand and the family of rancher Reinaldo Villalobos on the other. In a 1997 court ruling, the Garifuna cooperatives received titles to 1600 hectares of land in this area. This was confirmed by a 1999 Supreme Court of Justice ruling against Miguel Facussé, who had planted 100 hectares of African palma on this same piece of land. In the case of Villalobos, he illegally took possession of the majority of this Garifuna land. Reinaldo Villalobos has since passed away but his family still has security guards patrolling this land and controls access to the beach. 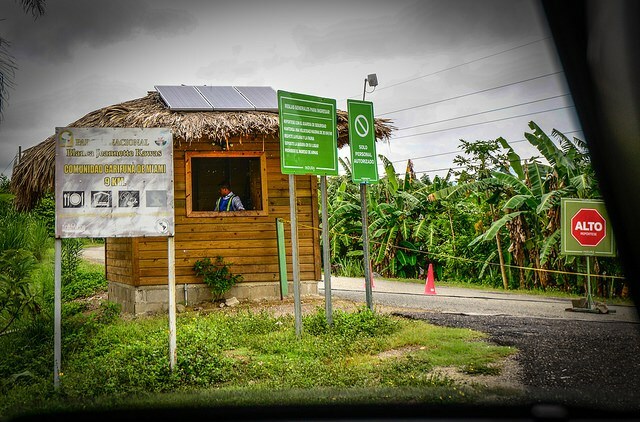 Since 2005, a regime of terror has been unleashed in this corridor between Trujillo and the Mosquitia by people associated with organized crime. Many families that lived in Vallecito have been expelled and economic activities have been reduced to a minimum. For the Fraternal Black Organization of Honduras (OFRANEH), the struggle for this ancestral territory that has historically belonged to the Garifuna people is of utmost importance. 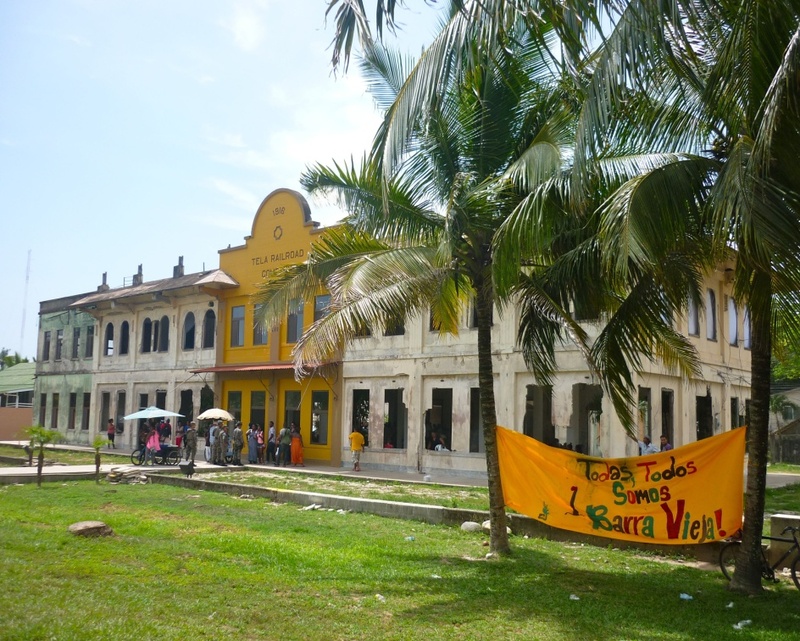 They consider it a territorial reserve for food security and the site of a future Garifuna University (1) . An OFRANEH video shows the steps they took to reliably establish the true boundaries of their land in order to assert their ownership of it. Two years without advances followed until July of this year when OFRANEH and 200 Garifuna representatives met with INA representatives in Corozol to demand demarcation of the land belonging to 15 Garifuna communities on the North Coast. In her speech, Miriam Miranda, President of OFRANEH, denounced the government’s silent policy of expulsion through powerful industries and tourism programs that only serve to sell the Garifuna culture. During this audience, Cesar Ham, Director of the INA, promised to demarcate those communities according to the existing titles and to provide the necessary measures (police, military) to be able to enter onto land that had been stolen. The Honduras Accompaniment Project (PROAH) visited the camp to be present when the government representatives arrived. Additionally, people from the United States, a group of German journalists, and several delegations also provided international presence in the camp. The camp seemed like it could have been a restful place if it were not for Facussé and Villalobos’ guards and their intimidation of the Garifuna community: they interrupted the night with bursts of machine-gun fire, entered the camp heavily armed, and patrolled the area. The night dances and drumbeats of the Garifuna community intermingled with fear and vulnerability. On Tuesday, August 28, the third day of the camp, the INA technicians arrived and surveyed the boundaries of one of the six Garifuna cooperatives, accompanied by over 50 Garifuna men and women. After finishing, they affirmed that their work was very limited by the lack of protection from the authorities, which they needed to demarcate the rest of the land. 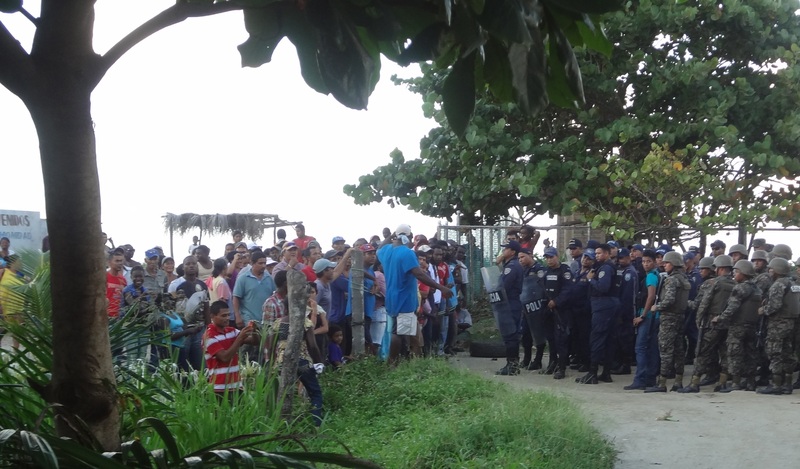 They pointed out that they needed the presence of the police, military, and Public Prosecutor’s Office in order to break the Villalobos’ gigantic gate that blocked access to the beach. Vallecito – Future Model City? It is well known that Vallecito is in one of the three zones for future model cities in Honduras. The model cities will be located in three Special Development Regions (RED), two in the north and one in the south of the country. These are autonomous zones with their own government and laws to promote free trade and attract investment. In the Vallecito area, there are multiple natural resources that are of economic interest: minerals, petroleum, beautiful beaches, and fertile land. According to OFRANEH, there is an unresolved problem with the implementation of model cities: What to do with the inhabitants who own their land and are not willing to leave? The government claims that the model cities will be in uninhabited areas but OFRANEH assumes there will be evictions because there are almost no uninhabited zones in the country. In the case of Vallecito, where the inhabitants have legal titles to the land, OFRANEH suggests that the expulsion strategy could be the absence of the government, which leaves the inhabitants subject to the will of the powerful interests and their armed groups. Shortly afterward, on September 13, the INA complied with its commitment from two years ago – accompanied by police and military entities and with an order from the Public Prosecutor’s Office — the Villalobos’ gate was broken and they succeeded in entering the land to begin demarcating its boundaries. The process had not yet concluded when the threats by the Villalobos’ guards began. They declared they would murder any Garifuna who came to Icotea, a neighboring town where the widow of Reinaldo Villalobos lives. 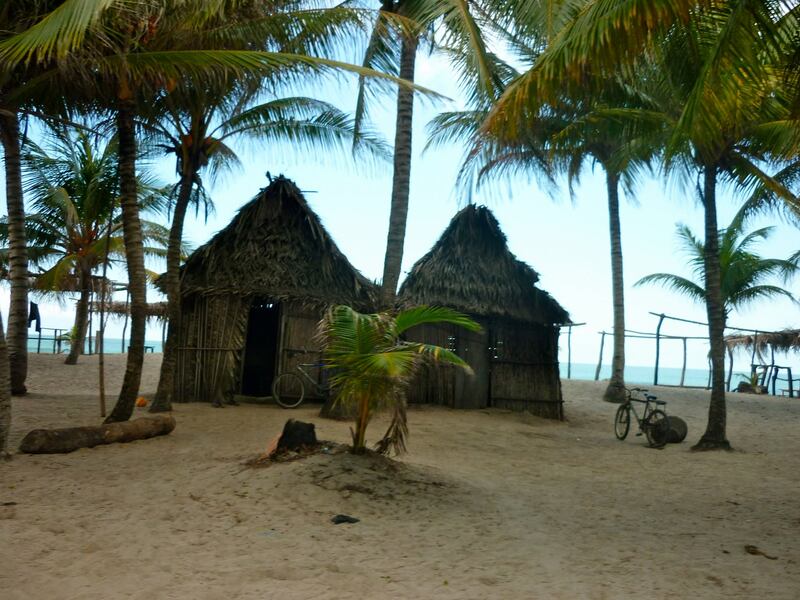 OFRANEH hopes the authorities issue an eviction order to return the land to the Garifuna cooperatives and guarantee the security of the community in Vallecito, who continue being harassed by powerful interests in the area. OFRANEH stated that “any attack suffered by the Garifunas will be the responsibility of Reinaldo Villallobo y de Miguel Facussé’s thugs as well as the government”. “Piratas en Honduras: De Gregor Macgregor y la República de Poyas, a la Ciudad modelo de Paul Romer” OFRANEH. Julio 18, 2012. “Pueblo Garífuna reocupa tierras usurpadas en Vallecito”, Comunicado de OFRANEH del 27 de agosto del 2012, documento: doc decl.Ofraneh2. Amenazan con desalojar garífunas tras recuperación, Artículo del periódico digital conexihon del 29 de agosto del 2012, http://conexihon.info/noticia/derechos-humanos/pueblos-indigenas/amenazan-con-desalojar-gar%C3%ADfunas-tras-recuperaci%C3%B3n-de. Crisis en Vallecito (Colón): Aclaración pública ante infundios del INA, Comunicado de OFRANEH del 29 de agosto del 2012, http://ofraneh.wordpress.com/2012/08/29/crisis-en-vallecito-colon-aclaracion-publica-ante-infundios-del-ina/. “Honduras, sospechoso silencio del Gobierno de Pepe Lobo ante caso de Vallecito”, Comunicado de OFRANEH del 30 de agosto 2012, documento:sospechoso silencio. “Se reanuda el Proceso de Remedición de Tierras en Vallecito, Colón, Comunicado de OFRANEH del 5 de septiembre 2012, http://ofraneh.wordpress.com/2012/09/05/se-reanuda-el-proceso-de-remedicion-de-las-tierras-de-vallecito-colon/. “Se logró romper el Portón de la Verguenza en Vallecito!”, Comunicado de OFRANEH del 13 de septiembre 2012, documento:Portón de Verguenza.